Remediation Helena: What Is Direct Push Drilling? What Is Direct Push Drilling? If you are unfamiliar with the world of soil sampling and remediation, you may have never heard of the term, “direct push drilling.” To no fault of your own, direct push drilling is an incredibly niche industry that requires a highly specialized group of professionals who use investigation tools to test water and soil samples for impurities. In today’s article, we will be taking an in-depth look at what direct push drilling is, the industries that use direct push drilling, and why these systems are important for analyzing both water and soil in a specified area. At Olympus Technical Services, Inc., we are the leading business that offers a number of environmental services ranging from environmental consulting and spill response to high-quality vacuum and daylighting services. Staffed by a broad team of professionals that specialize in areas such as geology, hydrology, and environmental and civil engineering, we are equipped to tackle the largest environmental service tasks with ease. If you are interested in learning more about our direct push drilling service and methodology, continue reading more on the topic below. 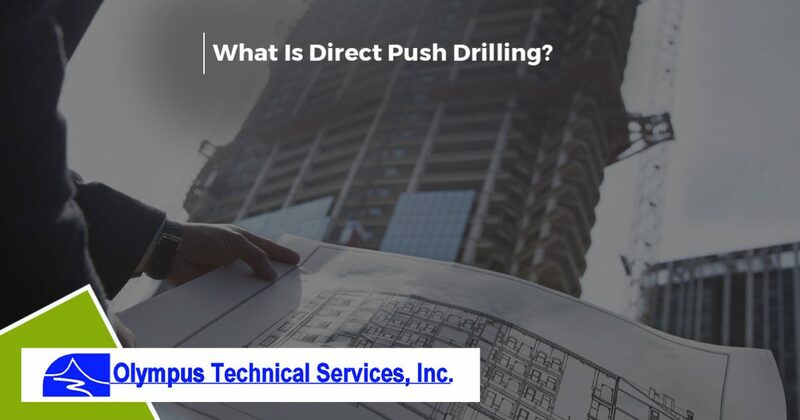 Why Is Direct Push Drilling Necessary? In order for soil and water to be sampled for potential contaminants, it is necessary to use direct push technology that can effectively reach the subsurface of the earth without disturbing surrounding soil. This feat is accomplished by driving a small rod into the ground using repeated hydraulic movements. One of the many reasons that direct push drilling has become more popular in the past 20 years is to address the need of quicker and more efficient soil sampling. Direct push drilling has solved this dilemma with ease, and even offers a number of advantages over traditional drilling methods. As we stated previously, one of the main reasons that direct push technology has continued to grow in popularity is because it is able to gather soil and water samples significantly quicker and more efficiently than traditional drilling methods. Not only is direct push drilling more efficient, its equipment is much smaller than conventional drilling methods like hollow stem auger drilling. Pairing this information with the fact that direct push drilling creates much smaller probeholes for easier probehole sealing, and quicker soil penetration times for more accurate sampling, you can begin to see why direct push drilling has become the preferred method for soil and water sampling around the world. If you would like to learn more about direct push technology, or are in need of the leading direct push drilling services in Billings, Helena, or Boise, get in touch with the environmental service experts today at Olympus Technical Services, Inc. We offer a number of industrial, field, and mine environmental services, and are available around the clock for any emergencies that may arise. Our highly qualified team holds professional engineering and geologist licenses in a number of states, and is prepared to resolve any roadblocks that you may be experiencing. To learn more about our full list of services, visit our website or get in touch with our team of professionals today!